Newport Beach Mayor Pro Tem Will O’Neill (left) poses for a photo with Orange County Auditor-Controller Eric Woolery after receiving the Taxpayer Watchdog Award. Newport Beach Mayor Pro Tem Will O’Neill was honored last week as a “Taxpayer Watchdog” by the county. 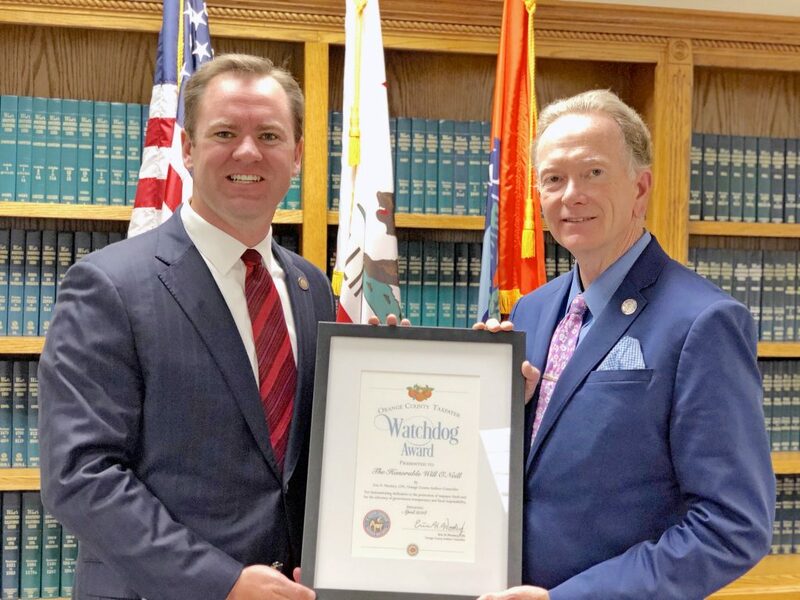 Orange County Auditor-Controller Eric Woolery presented O’Neill with the Taxpayer Watchdog Award on April 12. Wololery said O’Neill, who was on the city’s Finance Committee before being elected to Council, has championed “fiscal responsibility and transparency” during his time in public service. O’Neill mentioned the city’s stance of working down the unfunded pension liability as an important issue. “Our proactive and vigilant attention to pension liability has led to the first projected decrease in Newport Beach’s pension liabilities in years,” O’Neill said. “I am proud of the steadfast focus on the public’s interest and taxpayer dollars by the majority of my colleagues,” he added. Past Taxpayer Watchdogs honorees include Senator Patricia Bates, Irvine Mayor Donald Wagner, Huntington Beach Mayor Mike Posey, County Treasurer Shari Freidenrich, Orange County Taxpayers Association CEO Carolyn Cavecche, and others.